Inner City Press had asked the US Ambassador Susan Rice about Karti's quote as she went into the Security Council. “I don't quite know what to think of that,” Rice said. Now Daffa-Alla Elhag Ali Osman has told Inner City Press that she should look at history, that in the run up to the Comprehensive Peace Agreement there was a deal, in Southern Kordofan, involving the US, Norway and UK. Sudan is harkening back to that, he said, but is referring only to a small, “high ranking” force on monitors. When asked how many people, Daffa-Alla Elhag Ali Osman replied, “ten to fifteen.” It has been speculated that Karti's quote was related to a July 20 deadline set in the resolution winding down the UN Mission in Sudan. But only ten to fifteen? When asked from what countries, Daffa-Alla Elhag Ali Osman said they “could be European.” But again: only ten to fifteen? The representative of another Security Council member, not unsympathetic to Khartoum, when Inner City Press conveyed this said, “Oh, that's far too small.” Watch this site. Inner City Press had asked the US Mission to the UN on July 19 about Karti's statement, and on July 20 asked Ambassador Susan Rice about it as she went into the Security Council. “I don't quite know what to think of that,” Rice said. When UN Secretary General Ban Ki-moon came to the Security Council stakeout on Wednesday, one expected him to say something about the fighting in Southern Kordofan, and the allegations that UN peacekeepers, even before July 9, were at best inactive, or some say complicit. 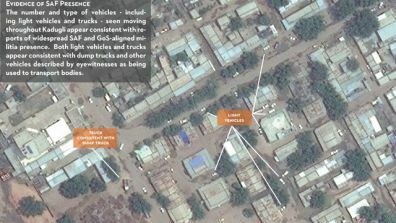 We will have more on this, including the UN's own report critical of its peacekeepers inaction in Southern Kordofan. Watch this site. UNITED NATIONS, July 18 -- On Southern Kordofan it emerges that the fight in the Security Council on July 15 was about whether the Council should be calling for an investigation of war crimes. A UN official confided that a real investigation will show misdeed by the UN peacekeepers from Egypt as well. The conflict of interest is that the Office of the High Commissioner for Human Rights was only in Sudan as a component of the peacekeeping mission UNMIS. How can the UN report on itself? 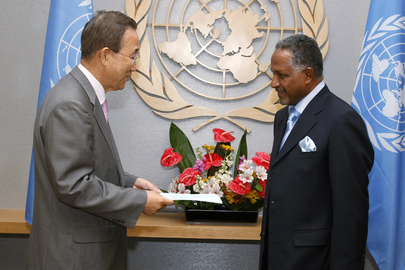 The balance for the UN involves at least four legs: political, peacekeeping, humanitarian and human rights. And they may well be the pecking order, with human rights right at the bottom, at least under Haile Menkerios -- who flew indicted war criminal Ahmed Haroun on a UN copter -- and Ibrahim Gambari in Darfur. What should future UN envoys do? How should they be judged? Watch this site. Footnote: Meanwhile the Justice & Equality Movement is bragging that it teamed up with SPLM-North and fought and killed 100 Northern soldiers. It is a war, and the UN sits impotent. We will continue on this.